Learn English in Montreal at our partner school EC Montreal, (formerly known as Language Studies Canada- LSC). The school offers both English and French courses, the latter of which can be found here. EC Montreal is centrally located with excellent links to public transport, as well as having the famed St. Catherine's Street close by, with its shops and restaurants. The institute is run by a team of experienced language teachers who will make sure you settle in straight away. The intensive courses in Montreal, consist of 20, 24 or 30 lessons per week. Classes have a maximum of 15 students. Minimum course duration is 1 week. We offer this intensive course at 7 different levels. The entrance test determines your level of English and the class you will be in. The lessons focus on listening, reading, writing and most importantly speaking. During the classes in the afternoon of the 30 hours course, extra attention is paid to a specific subject as vocabulary, fluency, conjugating verbs or TOEFL- or IELTS-preparation. As well as offering courses in English, the school also offers French courses and it is possible to combine these 2 languages during the intensive course. Special dietary requirements supplement: € 31 per week. Please indicate on the booking form if you wish to book this option. Airport transfer on arrival at Pierre Elliot Trudeau International Airport. In 2019 the school is closed on: 01/01/2019, 19/04/2019, 20/05/2019, 24/06/2019, 01/07/2019, 02/09/2019, 14/10/2019, 11/11/2019, 25/12/2019, 26/12/2019. Missed lessons due to bank holidays will not be refunded or rescheduled. Minimum age is 16 all year round. For under 18’s, a parent authorisation form must be submitted; single room homestay and airport transfers must be booked. No supervision is provided. Students should also provide a Custodianship Letter if requested by the Canadian Embassy. This may be arranged for a fee of € 104. In the largest bilingual city in the world you have the opportunity to combine two languages ​​during your course. 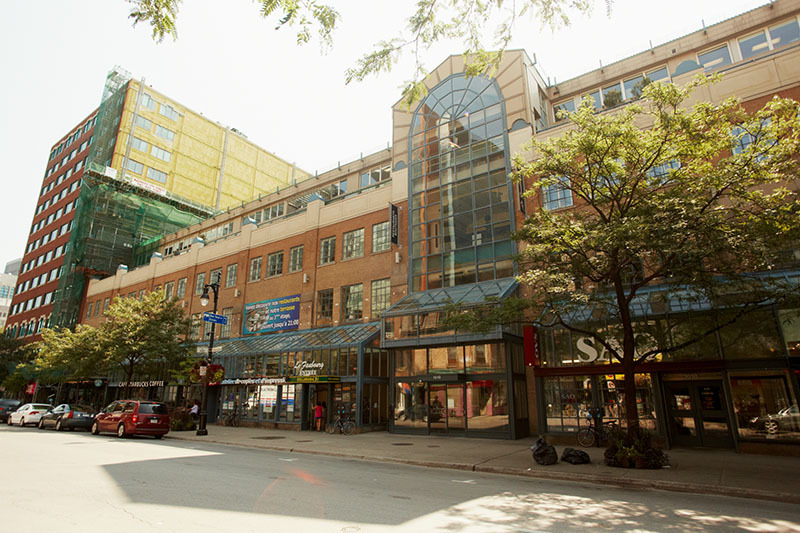 The language school in Montreal offers a unique program of either 24 or 30 lessons. You will have 20 lessons of English and respectively 4 or 10 lessons of French. For a complete immersion both the languages​​, you can choose to either stay with an English or with a French host family. This way, the emphasis during your language course is on learning English, but at the same time you can practice your French with the host family. This course prepares you for the IELTS exam, for example by giving you practice exam papers. The course consists of 20 lessons per week in groups with a maximum of 18 students. The minimum course duration is 2 weeks and the maximum course duration is 12 weeks. For the best results, the language school recommends to choose either 6 or 12 weeks, depending on the level. Please note: from 2019 onwards, the IELTS course consists of 30 lessons per week. The academic year course is a study program of 28, 32 or 36 weeks. The course consists of 20 or 24 lessons per week in groups with a maximum of 15 students. During the Academic Year program you have the possibility to prepare for the IELTS exam. Academic year courses (+24 weeks) include IELTS exam preparation, but not the exam fees. The one-to-one English course in Montreal involves 20 private classes per week with a native speaker and is designed for those who want to optimise their study time. The aim of this program is to offer a fully personalised method of teaching designed to meet the specific student's needs and desires. As the classes are private, the student will be able to choose the schedule and content. Host family accommodation is a great way of sharing in the daily life and experiences of an English-speaking family: a great opportunity to immerse yourself in local life of Montreal and practise your English in a friendly and informal atmosphere. Students can stay in a single or twin room with half board. The maximum distance to the school is 60 minutes by public transport. With an executive family, students can stay in a single room with half board with a private bathroom. The maximum distance to the school is 60 minutes by public transport. The 515-residence is located at 10 minutes walking distance from the school and consists of several apartments. You stay in a single bedroom with no meals. All apartments have a kitchen, a living room, TV, toilet, air conditioning and wireless internet. There are laundry facilities in the residence. The kitchen and showers are shared with other students. Towels and bed linen are changed weekly.